International Women’s Day (Friday, March 8, 2013, was not lost this year in Montserrat as several events took place marking its observation. The Royal Bank of Canada (RBC) local branch joined its other branches globally in celebrating women all over the world, observing International Women’s day, as they have for several years. 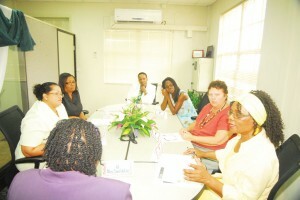 This year RBC hosted a one hour round table event for women. The event explored the topic: “Women in Business, are we seen as equals”. Personal Financial Services Record accounts officer at the Royal Bank local branch Carol White facilitated the discussion which was held at its conference room in Brades. The women there over one hour, discussed a wide range of issues relating to women, suggesting that women in Montserrat though not quite “there yet”, do enjoy a certain front position in many aspects of life in Montserrat. Miss White gave her perspective on the discussion to TMR. She said the round table discussion was in observance of International Women’s Day and Royal Bank of Canada one of its core values is diversity and we are committed to respecting people and encouraging people whether they be male, female, in respect of religion, creed, sexual orientation and age. “Every year we celebrate IWD day,” she said, concluding, “Well, there needs to be more discussion on women in business, and we need to take it out to the wider community, in youth groups, church organization and so on,” expressing the general outcome of the discussions. According to ZJB radio, Mrs. Teresina Fergus from Social Services says this movie was selected as it highlights a lot of issues which have a profound impact on women such as domestic violence, child protection, and HIV, as well as issues related to trust. Following the movie there was a spirited discussion around the issues which were underlined in the movie. She shares her ultimate wish. 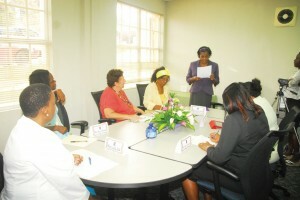 “I would say my ultimate wish for women and girls in Montserrat is for us all to reach to the point where we have true knowledge of who we are individually, who we are as a nation and that we can contribute to our personal and community and national development in a manner which suggest that we understand that we should at all times be fighting, not for ourselves individually but for social justice and for the ending of all oppression that violates any attempt that we are making at developing as a just society,” she said.